Can I copy my data across devices? ✔ New recipe card style! Party Time. Personalize your cards with custom card styles, available through the artist's pallet icon on the edit screen--Add More Styles, free and for in-app purchase. More styles forthcoming. ✔ Misc. bug fixes, enhancements, and optimizations. Q: How can I copy data across devices? 1) Connect the Master device to iTunes. On the Apps tab, find File Sharing, and scroll down to the appropriate app (Recipe Manager/Serving Sizer Pro/Trip Boss). 4) One last step is necessary, however. The receiving device must have the app completely closed to reload the new database. This step is important because info you add before the reload will not be saved to the database you just transferred. Ref. the Closing Apps part of this newsletter if you need to know how. Q: How do I backup my data: recipes or trips?? A: You can backup your files generically by syncing with iTunes, enabling iCloud backup, but we also offer File Sharing for individual database backups for our apps. Follow steps 1) & 2) above to save a backup file. Steps 3) & 4) cover how to load the backup back onto the device. When you open an app on the iPad and the iPhone, it stays open when you launch a new app, but it sleeps, until you or the operating system closes it (or you launch it again). The operating system will close it when it needs memory, when your memory is at max. However, sometimes this is not handled very well and apps can act up or things can run slow, since your memory is at always at maximum use. And, if you've recently used File Sharing, you'll want to close the app and reopen it so that the new database will load. Trip Boss travel manager is a one-of-a-kind travel app because it's modular. We offer three unique modules: Expenses & Budget, Itinerary Manager, and Journal. Plus we have a few tool add-ons as well: Currency Converter, Travel Time Calculator and Tip Calculator (also sold separately) Some of these tools are included with a module as a bonus. What makes it unique is you can combine the modules, which interact and share data, to make one powerful travel app. Pick one module to start, try it out, then add on any of the other modules through in-app purchase on our Store inside the app. In-app purchases are made just like an AppStore purchase, but instead inside the app. These unlock additional content, the modules in Trip Boss' case. Just tap our Store icon, then tap a module in the vending machine to find out more. Tap the price button to start a purchase. Confused on in-app purchase? Apple has a guide now available. For more information on what is included with each module, please have a look at our overview page. One of the best ways the modules work together is the Expense & Budget with Itinerary. As you are constructing your itinerary, you can add an expense right in the itinerary entry by tapping the forward arrow in the tool bar. The expense is added to your expense report, just like that. This feature works both ways. Let's say you decided to stop at the zoo while on vacation. You enter your entrance fees, but want to note this side trip on your itinerary, for future reference. 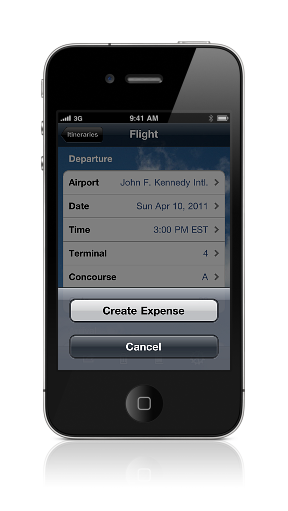 While entering the expense, just add the itinerary item, again using the forward arrow in the toolbar. Great for noting restaurants you've visited as well. The possibilities are endless. Trip Boss is so powerful because it's flexible and customizable. We tried our best to include default settings and international units, but hey, travel is complex, and your travel manager should be, too. So if you don't like what we started with, you can add new places, categories, types, and defaults. In many cases, we've added some cool shortcuts. For example, set up your home location in Settings. Then tap Home Airport, tap the Get Location icon in the toolbar (the arrow) and the app will detect the closest airport to your location. How cool is that? Tap on the Settings icon to set up all of the above, then tap on the File Cabinet icon to set up some Travel Data. Or don't. You can add things on the fly as you travel, or get all your ducks in a row before even starting a trip. Check out the little "i" button within the app. For quick, basic help, tap "Find Help for..." to see our help webpage. Otherwise, just tap "Contact us via email" and send us a short note. With few exceptions we respond no later than 2 business days (and more often MUCH quicker). Ask away. Share what you'd like to see. This app is your travel manager and we want to make the app part as easy as possible, so you can enjoy your travel! 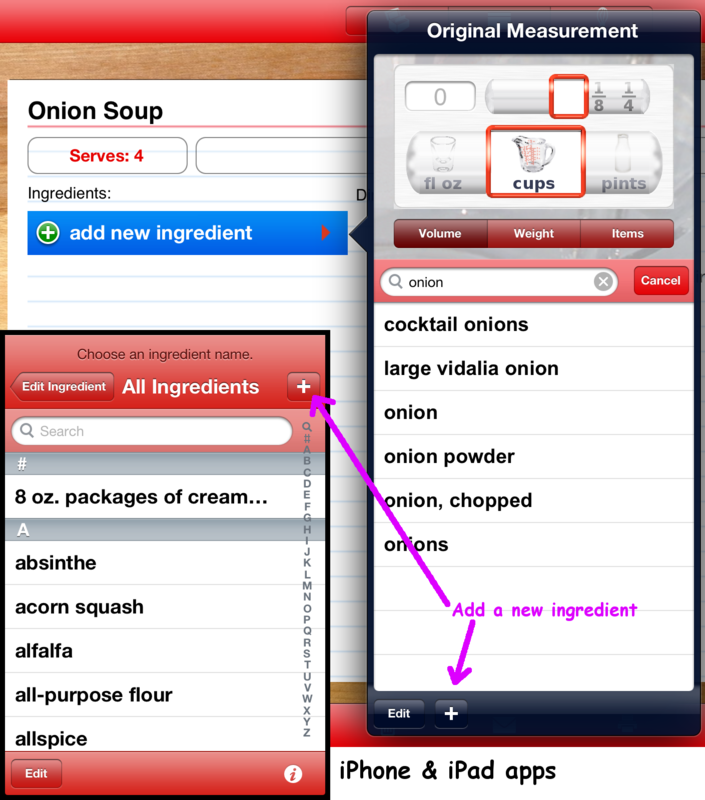 With Recipe Manager (iPad) and Serving Sizer Pro (iPhone), you can add your own ingredients, if you don't find them in the pick list of over 500 ingredients. Adding a new ingredient also works for adding a mini instruction to an ingredient, like "chopped" or "minced" or "to taste". 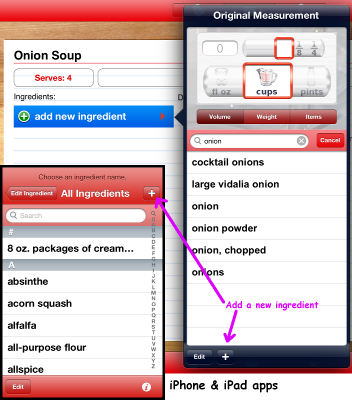 The iPad and iPhone have similar ways to add ingredients--just tap the "+" in the popover (iPad) or at the top of the All Ingredients screen (iPhone). On the iPad, you can search for an ingredient (like "onion"), then if it does not come up, just tap "+" to add the new ingredient. The text you've already typed is remembered, so all you have to do is finish it. In the above example, if I want to add "onion, minced" I can tap "+", then add "minced." Tap outside the popover to accept the ingredient. On the iPhone, you can do a search, but if you do not find the ingredient, tap "Cancel" then "+". The app remembers what you typed, so just finish up the name and tap the blue Done button by the keyboard. Each time we update an app, the review count resets. 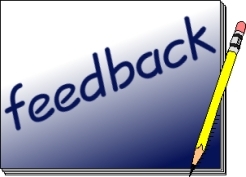 Positive reviews help us sell better and in turn, help us to focus on updates and enhancements, rather than other means of supplemental income. Your positive review is greatly appreciated and is a win-win for everyone! 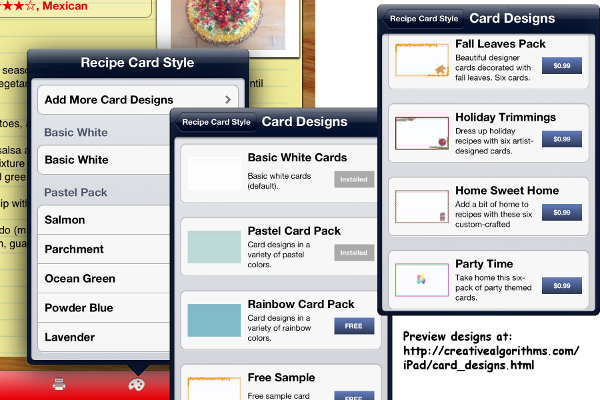 Recipe Manger with Serving Sizer on the iPad is designed so you can add colors or designs to dress up your recipe cards, or making them easier to find in your recipe box. Add the Holiday theme to holiday recipes, or Home Sweet Home to those comfort meals. Just tap on the palette icon on the tool bar, then Add More Card Designs to install new packs. Two free color packs are available, as well as a free sample from the designer cards. Add a pack of six cards for just 99c through in-app purchase. We're always looking for ideas for more card designs, so feel free to email us with your suggestions. Complete card packs can be previewed on our website.